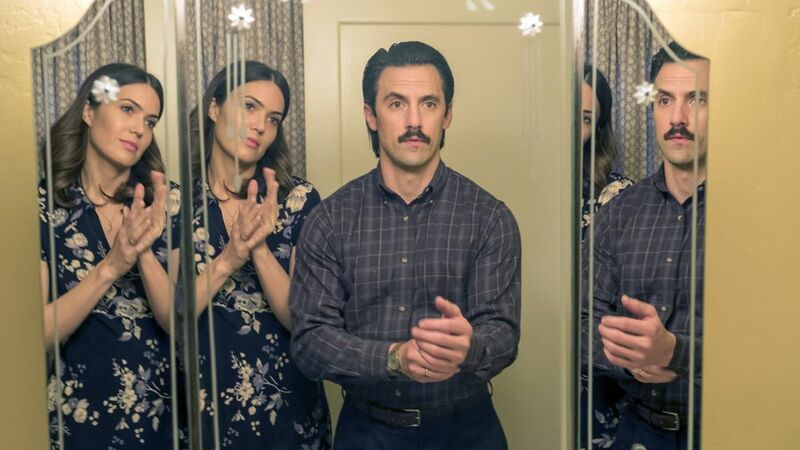 Any fan of This Is Us can't forget Jack Pearson's (Milo Ventimiglia) heartbreaking death by heart attack, caused by smoke inhalation from that "Super Bowl Sunday" fire. Now, viewers are getting a behind-the-scenes look at one of the show's most memorable episodes — and that includes that pilot twist. During a For Your Emmy Consideration event this week, creator and writer Dan Fogelman shared a clip from rehearsal of "Super Bowl Sunday." Plus, Milo Ventimiglia teases Jack's time in Vietnam in Season 3. In the video, fans can see as Mandy Moore, Ventimiglia, and Niles Fitch (who plays teenage Randall) move step-by-step through one of the scenes. Viewers also catch a glimpse at Ventimiglia's stunt double. As the rehearsal continues, Jack tells Randall and Rebecca to block smoke from coming under the door with a towel as he heads out to save his "Katie Girl" from the flames. Though the rehearsal it's much more light-hearted than the finished product, it still gives us flashes to that harrowing scene of the Pearson home engulfed in flames. Don't worry if you find yourself getting teary-eyed, since this isn't new when it comes to This Is Us! A special treat! Check out this video of @MiloVentimiglia rehearsing that "Super Bowl Sunday" house fire scene.